Qosina supplies check valves, which may be normally closed but open when fluid in the line reaches a certain pressure. When the movement of gas or fluid must be regulated by a medical device, that control is typically managed by a valve. But there are many kinds of valves that find use in a wide array of medical device applications. Selecting a valve requires consideration about the application of the device and the requirements for the valve. Check valves are a commonly used valve that permit the flow of gases or fluids in only one direction. In an intravenous bag, for example, check valves normally function open, explains Scott Herskovitz, vice president of sales and marketing for Ronkonkoma, NY-based Qosina. But these valves close in response to back pressure if fluid starts moving in the opposite direction. In procedures that call for inserting a catheter, a hemostasis valve can be used to prevent the backflow of fluid. Valves can also have a role in improving safety for medical professionals. In a needleless access site, a valve can be used to transfer the contents of a syringe to an intravenous fluid line without worrying about the possibility of a needle stick injury, Herskovitz says. When it comes to choosing valves, medical device makers have the option of choosing stock solutions or custom-made components. Off-the-shelf components offer a shorter lead time and are the more economical option. Qosina provides customers with volume discounts and can also configure orders to arrive monthly as needed; customers are only charged for what is shipped, Herskovitz says. The custom-made valves requested of Qosina typically involve orders for valves of a particular size, material, color, or style. B. Braun, the German medical device manufacturer with U.S. headquarters in Bethlehem, Pa., also supplies both stock and custom valves. Like Qosina, B. Braun encounters custom valve requests involving requirements such as size, color, and crack pressure—the pressure at which the check valve starts to open. “Often times, we can make a small adjustment to a stock valve to reduce the time and expense of starting from scratch,” says Joel Bartholomew, innovation manager for B. Braun’s OEM division. Valve selection should step beyond specifications and include an assessment of manufacturing needs and user requirements. Only then can the best valve be selected out of the dozens of configurations on the market. Other factors that affect valve selection include the type of fluid being moved through the valve and the compatibility of the valve material with that fluid. Material compatibility is an important, but sometimes overlooked, consideration for valve selection, Herskovitz says. In some instances, the valve material may interact with the fluid passing through the valve. Lipids, chemotherapy agents, and other caustic substances that move through a device can have a corrosive effect on a valve, Bartholomew explains. Suppliers also aim to avoid potential issues with materials such as natural latex. 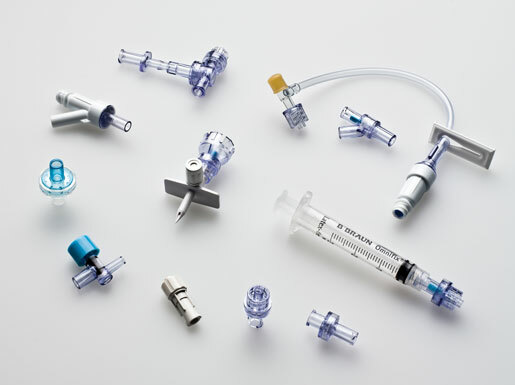 In some instances, valve makers are finding that device companies are now calling on them to provide valves for more specific applications, such as connecting a syringe to a line for drawing the contents of a line back into the syringe, Herskovitz says. In such cases, a valve prevents accidental injection of the syringe contents back into the fluid line. There are also new developments in devices that employ microfluidics, which measure fluids in nano liters or even smaller quantities. But Herskovitz cautions that valves need to be of a certain size for best results. Outside of the valves themselves, B. Braun is often asked to provide more detailed documentation and validation of the company’s quality systems and processes. Bartholomew says that customers want assurances that their supplier is taking every measure necessary to meet FDA requirements and minimize the chance of a reportable event. Bartholomew advises medical device companies that a valve’s functionality needs to be viewed over the entire lifespan of the device—from assembly through disposal. For example, customers must consider the combination of all potential mechanical stresses, as well as chemical stresses on the valve. Under low mechanical stress, such as applications involving low pressure, a certain level of chemical stress could be acceptable, Bartholomew says. But a high mechanical stress combined with multiple chemical stresses on the valve could result in malfunction. These stresses can occur during the manufacturing process, as well as during its application in the field. Device makers need to consider whether the valve will withstand the manufacturing process, he says. Other considerations include the compatibility of the valve material with the adjacent components and the solvent used to bond them, Bartholomew says. Medical device companies need to be aware of the potential for plasticizers to leach from the plastics used in the medical device. New developments in valve design at B. Braun include its work with different materials to address potential interactions with fluids. The shape, design, and material of the valve can all vary. Medical device companies must remember that some valves are suitable only for fluids, while others are appropriate only for gases, Herskovitz says. Valve suppliers also want to know how the medical device will be sterilized when finished. That’s because some plastics may be incompatible with certain sterilization methods, Herskovitz explains. Qosina recommends that device makers engage with valve suppliers early in the early stages of a project, as early as its design. “It is an easier choice if there are multiple options to work with for all components of a device being designed, instead of finalizing it one piece at a time,” he says. Want to catch up on the latest in medical device innovation? Register for the MD&M Minneapolis conference , November 4–5, 2015.